Arakkal Palace, in Azhikkal, 2 km from Kannur city, was once the seat of power and splendour of Kerala's only Muslim royal family. 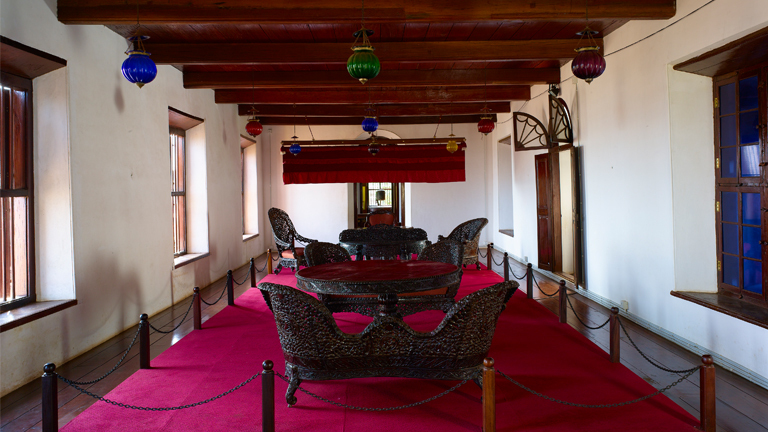 The Durbar Hall, once the official gathering place of the king and nobles, of the Palace, now holds a Museum managed by the Arakkal Family Trust. The palace complex called Kettu is an interconnected long block around a large open ground used for offering prayers or namaz. Built predominantly of laterite and wood exhibiting traits of local architecture the Palace has four mosques around the main palace block. Structurally, the upper floor of the palace has large halls with wooden floors. Windows of the palace are mostly double shuttered and have coloured glass panes of red or blue, providing a colourful display of light inside. At the Museum one can find exhibits that throw light on the maritime activities of the Arakkal Kingdom and its monopoly on spice trade. The museum also has items that indicate the Arakkal rulers' relationship with European colonial powers. Some of the interesting items displayed in the museum include; Pathayam - chamber for storing valuables; Adhara petti (document box); old-style telephone; swords and daggers; telescope and copies of the Quran. The Arakkal family, which in its heyday controlled the Maldives and Lakshadweep, had cultivated good relations with Hyder Ali and Tipu Sultan, and the Dutch, among others. The Arakkal family followed a matrilineal system of descent. The eldest female member of the family was made the head and ruler. The male rulers were known as Ali Raja, while the female rulers were called Arakkal Beevis.